Be sure to share this post and poll with your friends and family, your Google+ circles and your Pinterest people, your Facebook friends and Twitter followers. The more voters, the better. 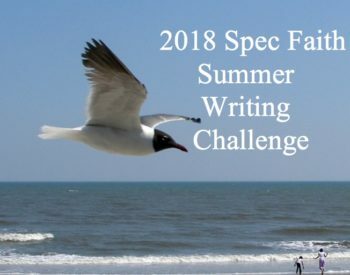 Special thanks to all who entered the 2018 Spec Faith Summer Writing Challenge and to all who gave their feedback in the preliminary rounds. As in other writing challenges, we had a lot of 2018 entries that received a high number of pluses. Clearly these were strong submissions, many from writers who haven’t entered this contest before. I hope the writing challenge has encouraged and inspired each to continue developing their storytelling skills. I was especially intrigued by the wide variety of 2018 entries—some science fiction, one involving a dragon, one with merfolk, even a contemporary. In many stories Bran was the king’s son, but in another he appeared as his brother. Some developed him as the king’s ally, but a number had the two as enemies. One even developed Bran as a female character. (I actually thought we might have more entries that went that direction, so that was interesting, too). All in all, I find the creativity of the authors who entered our 2018 Summer Challenge to be wonderful. That they could all take the same opening line and do such different things is impressive. As always, we’ve selected the three 2018 finalists whose submissions received the most positive responses over these past two weeks. 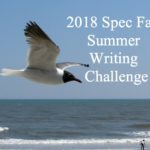 So here, in alphabetical order by last name, are your 2018 Summer Writing Challenge finalists: L. C. Crouch, Cathy H., and Zachary Totah. All that’s left is to select the winner. Choose from these three entries and vote in the poll at the end of this post for one entry you think is best. Voting will last until midnight (Pacific time), Sunday, August 12. If only Bran could stop the king, but he was too powerful, too sure he was right, Pallas thought as he reassured his stallion. The horse was uncharacteristically frightened by the cacophony of the battle in the valley below them. “Father, this battle was not appointed to us,” Prince Bran pleaded, his voice heavy with concern. The sun glinted beneath them, dimmed only by blood staining sword and armor alike. “As Commander of the Guard I must agree with Prince Bran. This battle has not been granted to us to fight. We will be risking many lives and forego the protection of The Sovereign,” Pallas said. King Caelan’s enormous, black steed pawed the ground, nostrils flaring, his coat glistening with the king’s heraldry. Who was more eager for battle, the King or his steed? “I beseech you, King Caelan, heed the Word of The Sovereign. He has not ordained this battle and that which He has not ordained, He will not bless!” Pallas tensed, awaiting the king’s wrath. The trumpets sounded, and his horse reared, intoxicated by the thrill of impending battle. The twang of bowstrings sounded a sharp staccato to the arpeggios of the king’s trumpets as arrows left their nocks. The king and his steed fell, still and silent. If only Bran could stop the king, but he was too powerful, too sure he was right, too noble. Should the serpent be released, he would face it as his sovereign duty. Bran’s leather armor creaked as he fought for balance when the tremors struck. His king- his brother- stood tall and strong, unswayed by the shaking ground. Squaring his shoulders, Bran forced himself to stand firm. He squinted at the sky. Murky clouds roiled overhead, masking the sun, and as the light dimmed, the field shook again. Fissures opened like hungry mouths to eat the tall, dry grass and withered flowers, and with a thunderous crack, the rock sealing the gateway split to reveal the deeper, darker chasm which extended to the roots of the earth. “I understand.” It wasn’t a complete lie. Bran swallowed bile. They ran side-by-side as they had in their youth, and jumped the expanding crevices. The fractured rock towered over the abyss from which the serpent would emerge to devour the world. The king tilted his head to the sky, praying, but Bran watched the void, alert for any variation in the darkness. Finally, the dull gleam of the serpent’s coils caught the failing light. His brother’s dark eyes bored into his, though the flicker of fear Bran saw might have been a reflection of his own. The king drew his silver dagger. But… There was a way to stop the king. Bran punched his older brother in the face. The king staggered back in surprise, and Bran wrenched the dagger from his hand. “I love you, Drystran,” he said. He hurled himself into the abyss to bar the serpent’s passage. The rock snapped closed above him. If only Bran could stop the king, but he was too powerful, too sure he was right. Trev stared at the words hovering in the pale blue projection above his floating desk, mind blank. He needed more. This ending wasn’t worthy of the Artisan Scholarship. Hot frustration surged up his throat. “Blast!” He banged a fist against his desk, setting it rocking above his ergonomic seat. Twelve hours until the deadline and the cursed last chapters wouldn’t cooperate. He blocked the projection as Kyra moved closer. Her jasmine perfume stung his nostrils. Despite the smile plastered on her face, her deep blue eyes smoldered. “Whose doesn’t?” Trev snapped. Each Artisan apprentice had one chance to change their fortune when they turned eighteen. Everyone needed it. Deep down, Trev agreed—despite the excellent pay and veneration artisans received. The world was bleak enough without taking advantage of them, without enslaving their skills to satisfy people’s escapist demands. He pointed at the sliding door. “I need to finish.” He’d come too far to let his dream—and his family’s hope of a better life—crumble now. “See you tomorrow, Trev.” Kyra strode out. Too quickly? Trev turned back to the projection. It was blank. Entire chapter erased. I’m not seeing the poll. The poll does appear to be posted.